The TRIN indicator, also known as the ARMS index because it was developed by Richard Arms, is functionally an oscillator-type indicator that is primarily used to identify short-term overbought or oversold conditions in the stock market. It does this by comparing advancing versus declining stocksStockWhat is a stock? An individual who owns stock in a company is called a shareholder and is eligible to claim part of the company’s residual assets and earnings (should the company ever be dissolved). The terms "stock", "shares", and "equity" are used interchangeably., along with advancing versus declining volume. TRIN is short for “TRading INdex”. The TRIN indicator is referred to as breadth indicator because it gives an indication of how widely spread, in terms of advances versus declines, a stock market movement is, as reflected in a major stock market index such as the S&P 500 Index or the NASDAQ 100 Index. Because the TRIN indicator factors in both price advances or declines and volume figures, it is seen as indicating both the velocity (advances/declines) and mass (volume figures) of the stock market’s overall price movement. The TRIN first divides the number of advancing stocks for the day by the number of declining stocks for the day. It then divides the volume of advancing stocks by the volume of declining stocks. Finally, it divides the result of the first calculation by the result of the second calculation. 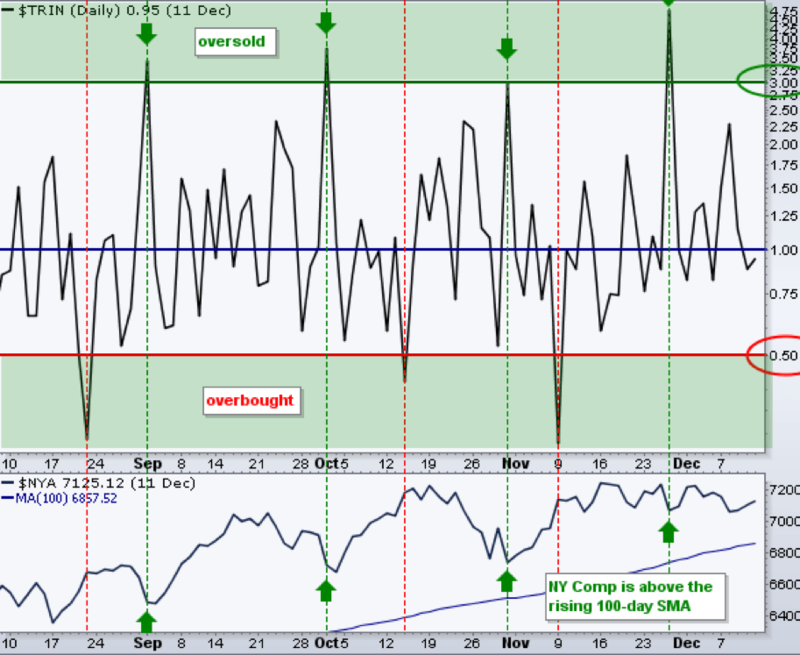 Successfully using TRIN levels to indicate temporary overbought or oversold levels in a market can be a bit tricky. First of all, TRIN values appear to be inverse, in that higher values indicate increased selling while lower values indicate increased buying. Generally speaking, TRIN values below 0.50 are considered to indicate overbought conditions in which analysts make anticipate an impending corrective retracement downward. TRIN values above 3.00 are typically interpreted as indicative of oversold conditions that may give rise to an upside rally. A TRIN value of 1.00 indicates a balanced stock market that is neither overbought nor oversold. One can quickly see that there’s a wide middle range of possible TRIN values between overbought values below 0.50 and oversold values above 3.00. In order to make the TRIN indicator more useful, analysts look not just at the basic TRIN values but also at how the TRIN value changes throughout a tradingKnowledgeCFI self-study guides are a great way to improve technical knowledge of finance, accounting, financial modeling, valuation, trading, economics, and other areas. These resources give you the technical skills you need to advance your career in investment banking, equity research, corporate development, and other areas of day or over a longer period of time, such as during a trading week. By doing so, analysts can more precisely pinpoint what constitute extreme levels, to one side or the other, in the TRIN under whatever the current market conditions are. For example, the market might go through a period where TRIN values go no lower than 0.75 and no higher than 2.25. In such market conditions, analysts may determine that those two extreme values accurately reflect overbought and oversold conditions for the market during that specific time period, even though they fall short of what are typically the TRIN value levels that are considered to indicate overbought/oversold conditions. Some traders and analysts who watch the TRIN indicator focus on the TRIN’s equilibrium value of 1.00 and consider any readings below 1.00 as potential indications of overbought conditions, and any readings above 1.00 as potential indications of oversold conditions. One of the shortcomings of the TRIN indicator is that its value can fluctuate significantly either intraday or from one trading day to the next even under overall market conditions that would not usually be described as volatile. In order to smooth out some of the inherent volatility in the TRIN indicator, some traders and analystsSell Side AnalystA sell side analyst is an equity research analyst who works for an investment bank or brokerage firm and produces investment research which is circulated to the firm's clients. The investment research is later used by the client to make a decision on whether to buy or sell prefer to look at a 10-day moving average of the TRIN value. Analysts commonly use the TRIN indicator to identify market conditions under which the short-term market trend may soon shift from bullish to bearishBullish and BearishProfessionals in corporate finance regularly refer to markets as being bullish and bearish based on positive and negative price movements. A bear market is typically considered to exist when there has been a price decline of 20% or more from the peak, and a bull market is considered to be a 20% recovery from the bottom (when the market is temporarily overbought) or from bearish to bullish (when the market is temporarily oversold). Traders may use the trend to identify potentially profitable buying or selling price levels. The chartHow to Read Stock ChartsIf you’re going to actively trade stocks as a stock market investor, then you need to know how to read stock charts. Even traders who primarily use fundamental analysis to select stocks to invest in still often use technical analysis of stock price movement to determine specific buy and sell, stock charting below shows that traders who bought into the market when the TRIN showed values above 3.00, indicating oversold conditions at the market levels indicated by the green up arrows, would have fared very well. However, traders who sold the market based on TRIN values below 0.50 indicating overbought conditions would not have been so profitable over the same time period. The TRIN is typically a leading indicator – one that projects a market turn before it happens. Looking at the above chart, one can easily see that the TRIN often anticipated an actual turn in stock market direction by a day or two. While this may afford a trader an opportunity to “sell the top” or “buy the bottom”, most traders will look for confirming price action in stock market index values before investing based on an anticipated market reversal. When TRIN values are relatively steady and around the 1.00 equilibrium level, many traders will stand aside and wait for further market action before making or adjusting any investments. Market activity that occurs without moving the TRIN indicator very much one way or the other is more likely to prove insignificant for the trading day. MACD IndicatorMACD Oscillator - Technical AnalysisThe MACD Oscillator is used to examine short-term moving average convergence and divergence. The MACD Oscillator is a double-edged technical indicator in that it offers traders and analysts the ability to follow trends in the market, as well as gauge the momentum of price changes.